February – Is it Spring? One day it’s cold and rainy, the next it’s bright and sunny. As you can see by my last post there is still a lot of color in Southern California and yes in Santa Clarita too. In addition to the color of fruit and berries, there are flowering plants too. As I walk around my neighborhood I find some beautiful early spring bloomers, so I’m going to share them with you. The first sign of spring, or is it snow? 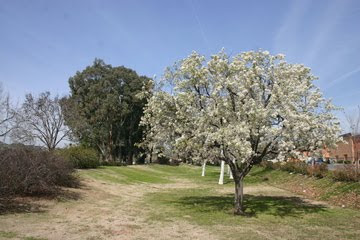 The beautiful Pyrus calleryana – Flowering Pear is blooming everywhere at this time of year. Take a look at its gorgeous blossoms both on the tree and on the sidewalk below. An added bonus comes after a rain storm (which we’ve had plenty of) look at the way the bark turns black and glistens in the rain. This tree is a true treat for your senses. 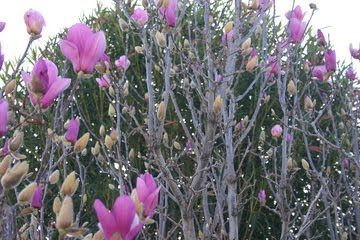 The deciduous Magnolia is beginning to burst into bloom, over the next few weeks take a look and watch them turn the trees pink, lavender and white. 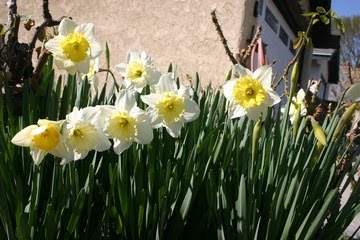 A real harbinger of spring are the daffodils, if you planted early in the fall, you are reaping your rewards now. If not, there are plenty of neighbors that remembered to plant so enjoy their display and don’t forget to pop a few bulbs into your container designs this year so you can be “surprised” next spring! Now don’t think February is all long walks and flower watching. 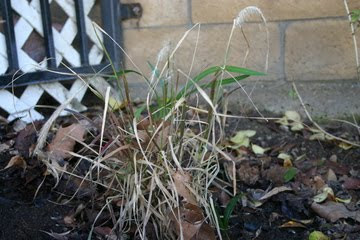 By mid to late February you should be cutting back your Ornamental Grasses. 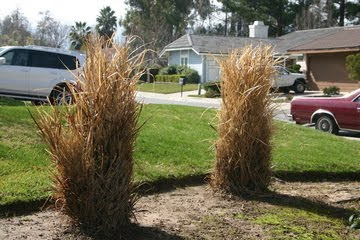 Cut back Ornamental Grasses to 4 – 6” or even back to the ground Miscanthus is named Deer Grass for a good reason. Pretend you are a deer and just mow it down! 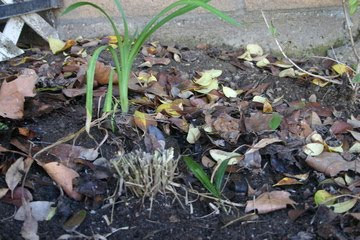 You want to cut them back before the new spring growth begins. Don’t be fooled by the trimmed look of these grasses … they have been cut but not cut back properly… Don’t make this ugly mistake in your garden. When you are done with your work take a break and be thankful that we have this fabulous Southern California weather, and that you can actually be gardening today and not our shoveling your way out of your house.